Fly Further And Longer With The Included Intelligent battery with 30 minutes of flight time per charge. 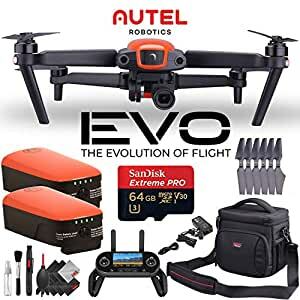 The Autel Evo is a serious competitor to DJI. Capture steady and sharp aerial videos and photos with the foldable Autel Robotics EVO Quadcopter. The built-in gimbal camera can record 12MP raw or JPEG photos or 4K video up to 60 fps in the H.264 or H.265 format to the included microSD card. Since the camera is balanced on a motorized 3-axis gimbal, videos will have a smooth, professional look to them, and the camera can be remote controlled to point wherever you need it. The included remote controller can direct the EVO from up to 4.4 miles away and has a built-in 3.3″ 720p OLED display for monitoring video. If you attach your Android or iOS smartphone running the free Autel Explorer app, you can take control of the EVO’s advanced functionality and intelligence to automatically follow subjects and orchestrate flight patterns. Using dual cameras at the front and bottom plus downward-facing ultrasonic sensors and rearward IR sensors, the EVO knows to avoid obstacles and can reroute based on built-in 3D mapping technology. Take the EVO for a flight and capture dynamic footage of moving subjects or fly it over epic vistas with ease. Compatible with both iOS and Android operating systems, the free Autel Explorer app provides a 1080p live view, flight telemetry, access to advanced settings, and intelligent flight modes.